when an older woman stopped me and said, "Oh, a Happy Mom! You look like you are all truly enjoying each other. Thank you for being a Happy Mom!!" Uh, thank you, lady. You caught us on one of our really good days. Yes, we were having a blast "driving" our shopping cart. Wearing our tutus (all day). Days like these are the ones to remember. I saw this lego bracelet online last night and just had to buy it. I thought it was cool and figured my kids would play with it during church, and I wouldn't be worried about them "breaking my jewelry". I also thought it would be a fun reminder of these wonderful days that we are so very blessed to spend together...just my children and me. We are so fortunate to have this time with them! I had to work, as a single parent, with my older daughter (who is now 23). Now with a 6 year old and a 3 year old, I am finally able to see what I missed and try to be sure I don't have to miss it again by being a good mom, supportive wife and frugal home maker. Even though it seems tough at times financially, I know if we can make through "just another year", the end results will be for more precious than a bit more "luxuries". Besides, how can anyone not be happy when they are surrounded by such innocent and pure joy? LOVE the lego bracelet. It's great to be a happy mom & the only thing better is that it's our choice to be one. What an amazing compliment! 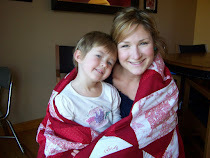 Just reading your blog inspires me to be a better mom!! 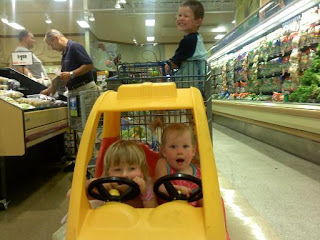 I was missing the car carts until I realized that all four of my kids would want to drive. And I don't think I'm talented enough to maneuver two of those things! Yea for a happy mom! Great compliment! post the shopping link..>I need a lego bracelet!! THanks for posting my bracelet, I appreciate it!!! Hope you love yours and the extra goodie I enclosed!